Katamari Damacy creator Keita Takahashi's next game, Noby Noby Boy, has been rated by the ESRB. That's good news. But even better is the software ratings board's helpful description of what Noby Noby Boy is. Oh sure, you may have actually paid attention to previews of the PlayStation 3 game, hopefully due any day now, but some of the slower Kotaku editors still don't quite get Noby Noby Boy. And Takahashi's certainly no help! Thorough ESRB descriptions, help us out! 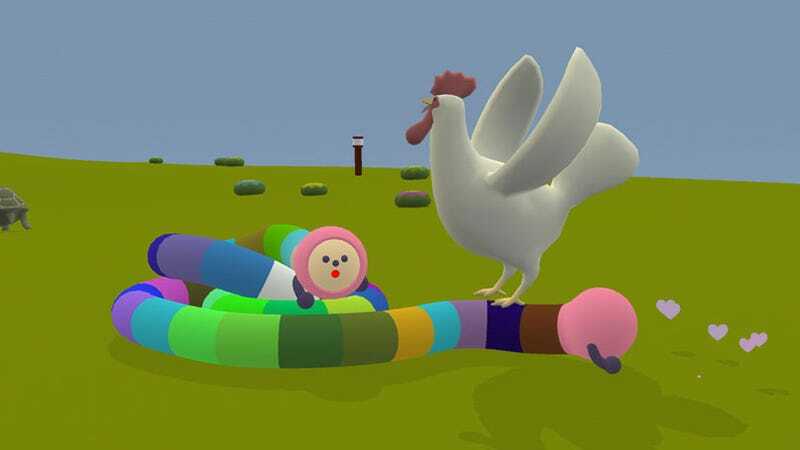 This is a puzzle game in which players control a large snake-like creature whose objective is to grow by gobbling up objects (e.g., mailboxes, small animals, houses, etc.). Players advance in the game by growing the creature as big as possible and then reporting its length to a character in space. Consumed objects sometimes pop out of the snake's rear end, making a comical "splat" sound. Well, that sounds quite a bit like Katamari Damacy to me. Consider me signed up, especially now that we can expect comical "splat" sounds.